German Shepherd Dog Forums > Special Interest > Weekly Discussion Topics > Can They Really Understand Us? If the dog has a simple, or complex communication system a human depends on both the dog and the human. There is always some level of understanding which can range from the dog knowing that when the human picks up the dog dish that it will be time to eat soon all the way to the level involved for working dogs. The trouble with communication with dogs is that there is more than the verbal communication and simple body language that we use. The dog body language is much more complex and they also clue into the environment to interpret the other language elements (like the sound of running water in the morning means a human is taking a bath and will let them out soon). I don't think it is really possible to compare canine-human communication to human-human communication because they are so different. The emotional communication is on a simpler level, but it is on a purer level. If you are sad the dog will not tell you what you could have done different, the only communication the dog needs is what is needed in body language to comfort you. I would like to be as good as my dogs think I am. I think dogs can indeed begin to recognize sounds and commands and associate them with what action follows. I think this is something that comes with repetition. 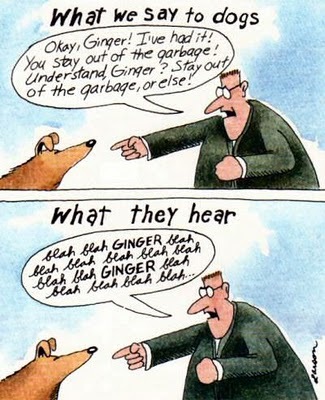 I think words can get a direct reaction from a dog. For example, saying 'sit' gets the dog to sit, or 'rollover' gets the dog to rollover. However, in terms of understanding, I think we are much more connected to our dogs on an energy level. This is what Cesar Millan preaches a lot as well. I believe when a dog truly understands its owner, it will know what to do without even being spoken to. I guarantee my two know what breakfast and supper means. O.K., story . . .
Last Sunday I took Birbo snowshoeing with me (our second time snowshoeing). During our walk we came upon a snowmobile trail. The snowmobile trail made it possible for me to remove my snowshoes. Not wanting to carry them I hid them behind a shrub and partially buried them in the snow. We continued on our walk. On our way back when we got close to where I had left my snowshoes I asked Bo, "Where did Mom leave her snowshoes?" I did not expect any real response, Bo is not trained to find anything . . . When I asked where my snowshoes were Bo paused and stood in one spot while turning his head to look around. Within 5 seconds Bo ran to the shrub where I had left my snowshoes. He started licking them and trying to dislodge them from the snow. This, I thought, was pretty cool. But, could have been a coincidence. Either way I love my boy . . .
Kobie-Pomeranian, my tiniest dog with the biggest heart. They understand us a whole lot more than we understand them. Think about it. You can train the dog to Sit and to Stay on command word. You can say a sentence with those words in it and the dog will do it. I can even tell my dog the wrong word, when I really want them to down and I say STAY instead, and the dog goes down because of my body language or whatever. But more often than not, if I screw up my verbal commands the dogs do what I want, moreso than what I say. We on the other hand hear the dog whimper, we ask do you want to go out, the dog gets excited, so we put him out. Doesn't want to go out, he wants his dinner! So five minutes later the dog is whimpering again, and we are like, "WHAT? I JUST LET YOU OUT!" The dog wants his food! Or the dog comes up to our hand and starts nudging it, Oh, you want to be petted -- No, MORON, I am HUNGRY! Get off your Rusty Dusty and get me my FOOD! After a horribly humiliating belly rub and thourough ear scratching, the dog trots off to the kitchen, and scurries around in there, pushing his bowl around and around the kitchen floor. FINALLY the owner GETS it! And feeds the dog. I believe my dogs have made word recognition and association much like a 2 yr old would do but Meika, my 6 yr old GSD definitely communicates with me. She uses her nose and touches things she wants like the door, leash,cabinet where the treats are or a garage door to tell me I accidentally locked a dog inside. She also will walk to people and look up to the ceiling, if you ask her what she is looking for then she will run to the fridge; on top of the fridge is her frisbee. She uses her nose to touch the outside faucet for me to turn on her sprinkler during the summer. Then we have Sasha, who brings in the water jug and drops it at our feet when they are out of water to soon. LOL I love my dogs! Dakota knows a lot of different words or phrases but one of the funniest things that amazes me is that she recognizes the ring tone on my phone for my husband and knows that he is almost home. He usually calls when off work and on his way home (ive always said "oh daddy is calling"). I have different ring tones for different people and she can differentiate and she runs to the door and waits now just whenever my phone rings with his ring tone. Sooo cute!! She also knows who "grandma and grandpa" are, we have to be careful because if we just talk about them to her (like if i say "grandma is on the phone") she goes and sits at the front door waiting for them to show up.